Technoscience is transforming contemporary health and medicine from the inside out, producing distinctive new processes---biomedicalization, geneticization and pharmaceuticalization. This volume valuably contributes to understanding these processes transnationally in biomedicine and public health, including consequences of neoliberalism. Terrific authors and provocative commentaries make it widely accessible and useful across the social sciences. Noted medical sociologists Susan Bell and Anne Figert have compiled a series of cutting-edge chapters on the world-wide spread of medicalization, pharmaceuticals, and genetic explanations of many behaviors. Highly recommended for courses in medical sociology, medical anthropology, and science and society. This is a timely collection of original essays in medicalization. The authors examine topics related to gender, race, and class as they intersect with technoscience and health from a global perspective. This major contribution is an essential reading for any class on health or medicine. This volume provides an excellent overview of the scholarly debate on the process of medicalization and of subsequent concepts, which capture recent trends in theorizing of and developments in medicine, health care and science. The volume is very much needed reading in courses on sociology of health and medicine. This lively edited collection focuses on major trends in medicine and science, illustrating how and where medical categories, pharma and genetics now organize daily life. 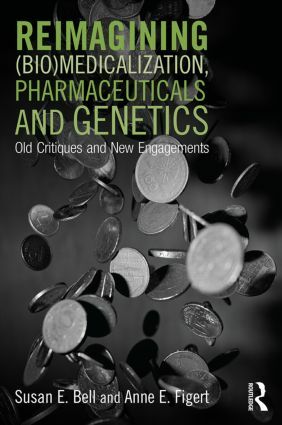 Most importantly, it investigates the structural factors that make pharma and genetics central and offers tools to forge ahead in the critical analysis of contemporary life. This collection of highly-readable essays provides distinctly timely perspectives on medicalization and biomedicalization today. The investigation of the spheres of genetics and pharmaceuticals are worthy in their own right, and the essays here also effectively use these focal areas to address important issues of global health, environment, race, and more. Medicalization remains a bread-and-butter concept for medical sociology courses awakening the sociological imagination. The contributors to this volume expertly explore its limits and promises through the relationship with all things bio, pharma, or genetic. Something akin to medicalization is rapidly unfolding around the globe. Nevertheless, the framework of medicalization is not equally applicable in all cases and places. This compelling collection of essays evaluates which "ization" (e.g., medicalization, biomedicalization, pharmaceuticalization, geneticization) is the right analytic tool to account for a host of transnational cases. Preface: Peter Conrad, Brandeis University Introduction:Susan E. Bell (Bowdoin College) and Anne E. Figert (Loyola University Chicago)"(Bio)Medicalization, Technoscience and Health in a Transnational Perspective: Outlining Old Critiques and New Engagements" PART I: Reimaginings: (Bio)Medicalization and Technoscience in the 21st Century 1. Susan E. Bell (Bowdoin College) and Anne E. Figert (Loyola University Chicago), "Moving Sideways and Forging Ahead: Re-imagining –Izations in the 21st Century"2. Ellen Annandale (University of York) and Anne Hammarström, "A New Biopolitics of Gender and Health? ‘Gender-specific medicine’ and Pharmaceuticalization" 3. Janet K. Shim, Katherine Weatherford Darling, Sara L. Ackerman, Sandra Soo-Jin Lee, Robert A. Hiatt, (University of California, San Francisco) "Reimagining Race and Ancestry: Biomedicalizing Difference in Post-Genomic Subjects" 4. Commentary and Reflections: Rebecca Herzig (Bates College) "On Stratification and Complexity: Matters of Difference in the Age of Biomedicaliztion" PART II: Pharmaceuticals 5. Jeremy Greene (Johns Hopkins University) "Vital Objects: Essential Drugs and their Critical Legacies" 6. Ari Samsky (Washington University St. Louis) "The Drug Swallowers: Scientific Sovereignty and Pharmaceuticalization in two International Drug Donation Programs" 7. Courtney Cuthbertson, (University of Illinois) "Pharmaceutical Technologies and the Management of Biological Citizens in Chile" 8. Matthew Archibald, (Colby College) "Essential Medicines, Drug Swallowers, and Biological Citizens: The Ongoing Construction of Pharmaceutical Regimes" PART III: Genetics/Genomics 9. Catherine Bliss (University of California, San Francisco) "Biomedicalization and the New Science of Race" 10. Ruha Benjamin (Princeton University) "Racial Destiny or Dexterity? The Global Circulation of Genomics as an Empowerment Idiom" 11. Sara Shostak (Brandeis University) and Margot Moinester (Harvard University) "Beyond Geneticization: Regimes of Perceptibility and the Social Determinants of Health" 12. Commentary and Reflections: David Hecht (Bowdoin College) "The Lure of the Gene" Epilogue:Susan Reverby (Wellesley College) "Mapping the Bio-medicalized World for Justice"